Indian Institute of Management (IIM), Ahmedabad is listed amongst the top three business schools in India, which is known for offering excellent education to those students who aspire to become an entrepreneur or aim of achieving higher position in the field of business management. The institute was established by the private group in cooperation with Government of India and Government of Gujarat and is approved by A.I.C.T.E. Institute is known for providing in-detail study of managerial skill in today’s business world. 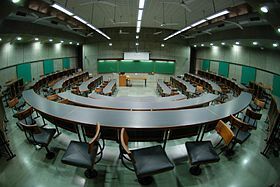 It offers several Post Graduate Management courses that equip students with different skills and techniques in order to tackle the challenges that often rise in today’s competetive business field. IIMA also became the first business school in the country to be awarded EQUIS (European Quality Improvement System) accreditation in the year 2008. Institute offers various management programmes, whose admissions are based on different entrance exams and eligibility criteria. Applicants willing to seek admission in the IIM Kolkata can register through online or offline process. Application forms will be available on the official website of the institute. Institute accepts valid scores of CAT entrance exam which is conducted by IIMs itself for post graduate and fellowship programs. Along with the CAT scores, candidate must be graduated in any discipline with minimum 50% marks (45% marks for reserved category) from any recognized university or those appearing for the final year can also apply. IIMA is spread over 67 acres of lush greenery land in Vastrapur in Ahmedabad. The most important feature of the campus is the Louis Kahn Plaza that has been the host of many festivals and celebrations. The Institute has highly qualified and experienced teachers with reputation in their areas of specialization. It has sufficient books and periodicals in the library and fleet of buses for transportation. The institute has developed a new campus that is divided into two sections i.e. one for PGP, PGP-ABM and FPM courses, whereas, the other section is considered as International Management Development Centre. All classrooms, seminar rooms, syndicate rooms and offices are air-conditioned. The institute also offers separate hostel facility for boys and girls. Each room has a small balcony, attached toilet and bath, internet connectivity and phone facility. Average salary offered is 13.05 L p.a. and highest salary offered is 32 L p.a.